So I have this online personal assistant, who I know I’ve mentioned before. His name is Prathap, and I use him for a lot of different things, most of which are to entertain me and have fun. 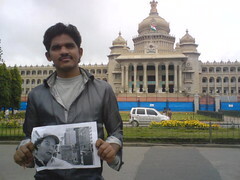 I have him call my friends to ask how they’re doing, he and his team are working on a Rodney Dangerfield impersonation contest entry right now, and just recently, I asked him to print out pictures of my face and wander around Bangalore, India, carrying me with him and posing in front of some famous monuments. First of all, he thinks I’m the greatest boss ever. Third, and most importantly, HOW DOPE IS THAT MUSTACHE? !